Russian Forces in Syria and the Building of a Sustainable Military Presence: Towards a Restructuring of the Syrian Army? A “soft conflict” between Russia and Iran on Syrian soil began to take shape when Russia decided in 2015 to intervene militarily to assist the faltering Syrian regime. ARI provides an exclusive two-part study of the nature of this relationship in regime-controlled areas. It looks at the mechanisms used by Russian forces to establish a sustainable presence in Syria from the consolidation of their military bases and the restructuring of the Syrian army to serve Russia’s influence (Part I), to gradually neutralizing the role of Iran and its reliance on militias (Part II, forthcoming). The Russians became fully in charge of the Syrian Army and started to instil rules and regulations that would ensure discipline and transform the army to a professional force capable of actual missions on the ground. Such rules included entrenching among Syrian soldiers, non-commissioned officers, and officers’ allegiance to Russian military officers and meant to subdue and prevent them from exercising their authority. This has established the Russians as the de facto leaders in the minds of members of the Syrian army. This has mainly shifted the responsibility for all the atrocities committed by the Assad forces under the Russian leadership to the Russians together with the regime’s officers and leaders. Despite their inability to make decisions, they are responsible, in terms of political structure and posturing, for all cases of genocide, chemical attacks, displacement, starvation and other violations. It has therefore become difficult in the Syrian context to separate between the Russian leadership and the Syrian Army, except in terms of differentiating between the leader and the follower, a divide that Russia has been working on consolidating in the media and in its diplomacy as an entity “assisting to achieve peace and combat terrorism”, while it undoubtedly deserves the description of “occupier” with its ability to run a lot of important issues on Syrian soil. 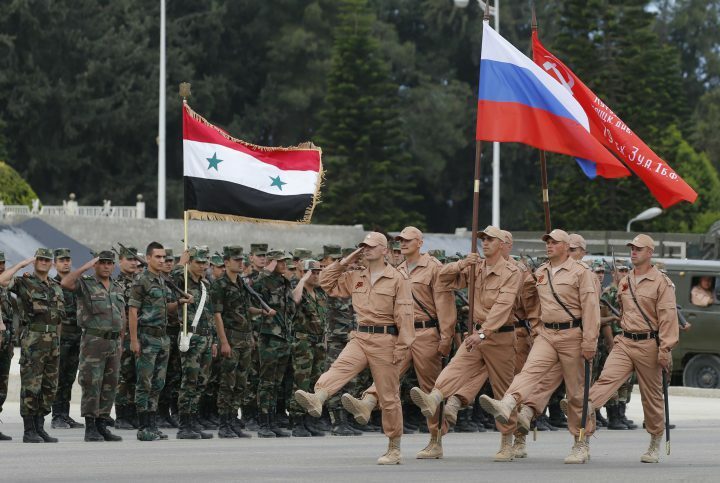 Russian forces entered Syria after the Assad regime’s formal request to Russia to assist with the ongoing war in the country in September 2015. At that time, the regime’s military forces and its Iranian ally reached a state nearing total collapse throughout the country. This has positioned Russia as the saviour of the Syrian regime and Iran in their war against Syrian opposition forces. This paper seeks to examine the nature of the relationship of the Russian forces with the regime forces, and the militias backed by the regime and Iran. It also attempts to answer questions related to regime sovereignty in Damascus and its ability to take military decisions and manage the course of battles and events in regions it jointly controls with the Iranians, and the Russians. To be able to investigate the nature of this coalition, the paper focuses on the Syrian Army, a domain that remained out of Iran’s influence in the period before Russian intervention, except for the so-called Army of Suhail Al Hasan, which the Russians treated as another brigade of the Syrian Army in the battlefield due to the difficulty of disbanding it and the Russians’ ability to benefit from it as a paramilitary unit. The paper will also try to shed light on the changes in the regime’s army and security forces and the extent of their impact on the current regime structure. It will present testimonies by military personnel in the Syrian Army (with whom the researcher made in-depth interviews, without mentioning their full names for their safety) and analyze these testimonies and new encounters with the Russians in the regime’s army. Government and opposition media have considered the regime a single entity aiming to have full control over Syrian territory under an announced agreement to sustain and keep the Assad regime. This became commonly known as a victory for the regime over the opposition while differences between Iranian and Russian influences over the regime were seen by some as a “smooth conflict” between the two allies. The reality, however, confirms that these differences go much deeper and concern the Iranian and Russian visions of the shape of the Damascus regime. As a result, it becomes difficult to consider the Russian intervention on the ground a continuation of the regime’s project to eliminate all forms of opposition, even though this is a common denominator in the Russia-Iran-Syrian alliance. Even though the actual Russian intervention in Syrian territory came to save the regime from a stifling military stalemate, it came with different terms and conditions. The Russians have proven to be agile in manoeuvring all regional and international actors in the Syrian case and able to negotiate with all factions on the ground (except with extremist Jihadi groups). They also started – slowly and away from the limelight – to produce mechanisms to create a new regime in Damascus to fit the form of the old regime but with a built-in structure that is in favour of Russia’s continuing influence and different from what was previously in place or what Tehran would want. Russian forces were first deployed in Tartus port and Hmeimim Airbase and deliberately avoided direct contact with the Syrian population except in limited cases. This contact was later expanded in a planned manner in the military framework and included a segment of Russian officers who took charge of leading and training military divisions in Syria. The relationship between Russians and soldiers and officers within the Assad regime military divisions can be illustrated by three examples where these divisions were in charge of guarding Russian military bases in Tartus Port, Hmeimim Airbase, and Mezzah Military Airport. The port has two sections, one military and one civilian. Before the arrival of Russian forces to this seaport, the Syrian Navy was stationed in the military part. Russian officers and military experts were also present in the port under cooperation protocols between the regime and the Russians that were signed since the Baa’th Party took power in Syria. When Russian forces arrived at the seaport, a few commercial docks of the civilian part were added to the military section and followed by successive maintenance work to further prepare the port. Russian forces then stationed guards around the military and civilian parts of Tartus port. For this purpose, guard battalions of the Syrian Army’s Fourth Division were deployed to work under the direct command of Russian officers. The Russians tightened control of the guard battalions and noticeably improved their performance: they set up regular patrols to observe their job and punish any Syrian officer responsible for any breach. Punishments ranged from humiliating and scolding of Syrian officers in front of their group to imprisonment. No Syrian officer is immune to beating or physical and moral violence in case of resistance, regardless of their rank. Russian officers used the old Baa’th Party building for accommodation, as well as a few other hotels. In addition, a resort is being built on the waterfront as a military investment for Russian forces. Little information is available about this project which might be a residential area for the families of Russian officers who rarely mingle with the Syrian civilian population. The Russians have expanded Hmeimim Airbase, the main military airbase for Russians in Syria, since their arrival. Two battalions of the Syrian Special Forces heavily guard the airbase and provide services such as food, water, and day-to-day needs, including transport for Russian military personnel to their hotels in Latakia. Transport drivers are Syrian officers who have been appointed since the arrival of Russian forces to the airport. Most testimonies of Syrian officers operating in Hmeimim ascertain that the Russians run the airbase with the same method and discipline used in Tartus Port. This important strategic airport was under the direct management of the Syrian Air Force Intelligence. Upon the Russian intervention in Syria, Russian forces took full control of it and removed all Air Force Intelligence personnel and elements from it, but kept the Air Defence brigades, which were deployed to guard the airport and provide other services. The Russians use Mezzah Military Airport as the command headquarters for their ground forces more than a military airport and managed it without any interference from Syrian officers. 3. New Army Corps and a Different Military Spirit? The Russians announced the establishment of the Fourth Corp, also known as the Red Line, in the summer of 2016, with its centre in Masyaf, Hama province, near the Syrian coastline. It consists of brigades and battalions belonging to the Syrian regime’s army placed under the direct command of Russian officers, who would oversee the training, guard system, ammunition supplies, deployment, and full-scale military planning. They also manage the Syrian officers’ vacations and salaries, paid in US dollars starting at $250 a month (which is considered relatively high as the salary of most regime army’s elements does not exceed $100 a month). On the other hand, the Assad regime announced the establishment of the Fifth Corp-Raid, with its centre in the Latakia Vanguard Camp (Mu’askar Al Talai’, a former camp for schoolchildren close to Latakia). The Russians started to populate it with volunteers attracted by good salaries. As with the Fourth Corp, everything was under Russian direct command. The same goes for the Sixth Corp in Qatana close to Damascus, where the Tenth Division of the regime’s army is also located following the transfer of its facilities. The Six Corp is known for receiving conscripts, the reserve forces of the regime, and all those who failed to appear for compulsory service or to respond to the call for reservist forces. Syrian officers there also work under the close supervision of Russian officers. H. A., a non-commissioned officer who escaped from the mandatory service after being arrested by the Military Police in Latakia and was deployed in the Sixth Corp in Qatana, says: “The average Russian officer starts the day at 6:00 am by an inspection of the cleanliness of dormitories in the company of Syrian officers. He would shout at soldiers if he finds a soldier’s boots a few centimetres away from where they are supposed to be. Then he would curse Syrian officers accompanying him using local swearwords. After that, the physical training session and lessons on tactics and weaponry start, all delivered by Russian officers. Everything runs like a Swiss watch. The Sixth Corp is run with strict adherence to the rules and regulations of the Russian service. Russian intervention in running the battles of the regime started initially by sending missile, anti-tank, and reconnaissance experts to accompany regime forces and Iranian militias. With the second Tadmur battle of 4 March 2017, the Russians took over command of military operations with Iranian and regime officers, soldiers and equipment under their direct orders. Until now, there is no recorded involvement of Russian armoured ground troops or tanks in battle; rather, the existence of Russian elements at the rear-guard and leadership positions has been observed. The most important battles run by the Russians are the Aleppo battle, the latest battles against the so-called Islamic State in the Syrian Desert, the liberation battle of Deir Al-Zour and Al Raqqa, and the latest battles in Damascus where Russian officers were in charge of planning and assault as well as of ceasefires and settlements. Similarly, they synchronized the movements of regime forces and Iranian militias with great precision and limited the chaos that would break out every now and then at frontlines. G. D., a regime lieutenant who serves in the Brigade No. 550 camp in Tadmur, says: “The Russians took a leadership building as their headquarters inside the Brigade and placed it under Russian guards as a separate part inside the brigade. They were in control of everything: their officers would oversee the work of the brigade, inspect everything, and interfere with details such as the soldiers’ dormitories, ammunition stores, the offices of Syrian officers, punishments, vacations, officers’ vacations, and the way officers treat their soldiers. They were simply in control of everything. Lt G.D. also stressed out the fact that Russian officers often interfered in favour of Syrian soldiers to draw the line between rights and duties and prevent Syrian officers from bullying them, a thing that has always been at the core of the regime army’s customs. Many other testimonies also confirmed the full control by Russians over the conduct of military operations on Syrian land and on the overall daily military life. We have not received a single testimony to the contrary, except for soldiers or officers who refused to respond to our questions. The Russians are well aware of the fact that there is a certain historic imperative arrear in Syria. They also know very well that it is not possible to rehabilitate the Assad regime in its previous form. That is why they are working on forming a new regime that might carry in its early phases the shape of the former regime and that guarantees for them a smooth transition to a state structure that would serve their interests for decades to come. The Russians have started to take charge of the army and worked to reshape it to guarantee control on the ground. They have also changed the militias’ shape and role. They have – in principle – kept the structures of security agencies, although some changes have started to surface making these agencies the second target for Russians after taking control of the army. In addition, despite the importance of transitional justice in consolidating peace and working on a collective national project for all Syrian citizens, Russians, as well as all other forces and actors in the Syrian case, have no intention of moving to transitional justice after slowly starting to set up a new regime in Damascus.